Wholesome, fresh, natural & delicious! GMO Free! >The hunt for a higher quality, more nutritious, more natural and GMO Free ingredients in bird food blends is over. 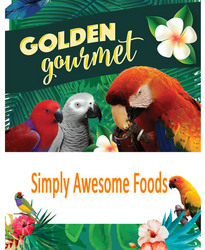 Golden Gourmet prides itself on quality foods for your companion bird, devoid of GMOs, stale and "bargain" close-out ingredients and fillers. Made with love and pride in the USA. For Medium to large parrots, this treat blend contains the very best shelled nuts & fruits. Chock full of almonds, shelled walnuts, dried apples, cashews, diced papaya and pineapple, dates, apricots, brazil nuts, diced mangos, etc. A great treat blend for small to large birds, from conures to macaws! Fortified with bee pollen. A fun addition to your regular diet, or an evening treat. GMO Free. No Corn. No Peanut blend.